Loughros Heritage Group are holding a 25 Card Drive fundraiser in Teague’s Bar on Friday, 14th December, starting at 8.00pm. All are welcome and your support will be greatly appreciated. The A.G.M. of the Donegal G.A.P. Heritage & History Group will be held on Saturday, 1st December at 3pm in the Parish Centre. The new Doon Fort and Spanish Armada display exhibitions will also be launched. Everyone welcome. 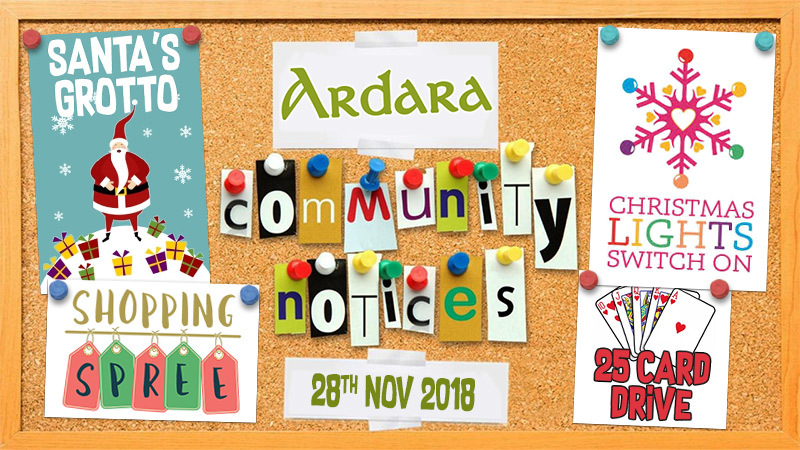 Ardara has launched a strong campaign for this year’s Shopping Spree from Thursday 6th December to Saturday 8th December. Please support local businesses and local jobs. Friday night 21st December is the launch of the draw for first prize in the fantastic Christmas Lights Draw. The first prize is flights for two to New York with €500 spending money (see below for details). 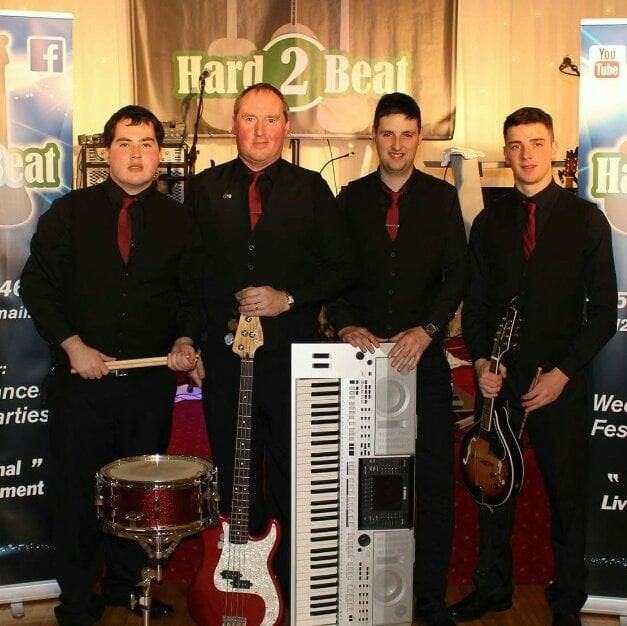 Dancing is from 11pm with the band “Hard 2 Beat”. The Brass Band, mince pies and mulled wine has been a great tradition at the Flowerpot each year. Gratefully organised by Geraldine Ferguson. It’s great to say that the popular tradition continues this year on Christmas Eve. Tickets are selling well for the Christmas Lights Draw, with amazing prizes to be won! 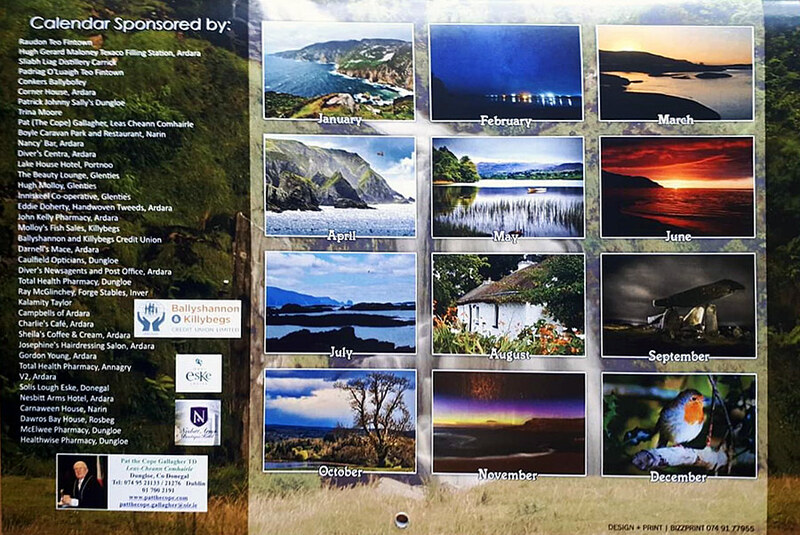 The Ardara Camera Club Charity Calendar: Local Images in aid of Pieta House Letterkenny is available for €9. All proceeds go to the charity. All 12 photographs can be easily removed and framed as keepsakes. Calendars will also be on sale at the Clanree Hotel Letterkenny Christmas Fair this weekend, where there will also be a large selection of photographs mounted and framed for sale at reasonable prices. Contact the Camera Club on Facebook, tel 0860773359 or email ardaracameraclub@gmail.com. CANCELLED: The Craft Fair on Saturday 1st December had been cancelled until further notice due to family illness. Apologies. The sympathy of the community this week goes to the McHugh Family on the death of Mary Mahan who died in England during the week. She was a sister of Patsy and Christy McHugh, Glengesh.